After dealing with a crook with an explosive variation on the evil eye, Lobo's bike is trashed, and he's forced to use his target's brain in his space-fragg to get it working again. And it's just in time too, since he's got a new gig. Seems someone put out a warrant and bounty on John Jones... Too bad that John is the secret identity of the Martian Manhunter! Meanwhile, an isolated planet is taken over by something called the Alpha, which soon drives the inhabitants towards building weapons of death. On Earth, John Jones is on a case, trying to help a grieving mother save her last surviving son from a life of crime. No sooner does he start getting through to the boy, than Lobo interrupts and takes John away. Once isolated, John transforms into the Martian Manhunter. Lobo takes offense when he asks to see the warrant, and a battle ensues until Superman interrupts it. He manages to see the warrant, which strangely lists no crime. The Manhunter goes with Lobo willingly to find out what's going on. Superman decides to investigate. The criminal Lobo lobotomized and placed in his bike, Xemtex, awakens to his horrifying predictament, and sets a trap using his comm system and the surviving members of his gang. Lobo's responsibilities as a member of the galactic community force him to respond to the fake distress call the gang creates, and their attempt to steal J'onn and his bounty falls apart. However, when Lobo does deliver J'onn, things go south as the Alpha reveals itself, and Superman discovers that someone in the galaxy, the Alpha, is illegally performing genocide. Story - 1: Bear in mind, there were times I liked this story, but overall, the weakness of the plot, the poor pacing, and several out of character actions really ruined the novel for me. First of all, right off the bat, half the plot, namely having Lobo capture an alien hero, taking them to a benefactor, only to realize that they're both targets, is ripped directly from "Superman: The Animated Series" episodes "Main Man" (Parts 1 and 2). I mean, a complete ripoff. Not an ounce of originality to be seen. Does Grant think we're stupid enough not to remember one of the more entertaining stories from the cartoon? Second, the pacing was completely off. It's no spoiler to say that Alpha meets defeat. It IS upsetting, however, that this "A" plot is over with more than 50 pages left to go in the novel, meaning several chapters of utterly pointless Lobo-centric violence while Superman and J'onn pretty much don't do anything interesting. And this is after the novel starts with three chapters of more Lobo violence, which serve only to bring Xemtex into the story and set Lobo off on his quest to find John Jones. That should hve been one chapter, at most. It's overkill, it's obnoxious, and it's more Lobo than I ever wanted to read in my lifetime. Third, there were many, many moments that just made no sense at all. For example, Superman's a smart guy. When he goes to the Alpha's base, knowing that J'onn's got to be inside, does he wait and try to contact his friend telepathically? Nope, he flies inside, THEN does it. This is disasterous. It's bone stupid. And all it does is make things worse. Another is this... J'onn, when escaping Lobo's handcuffs, breaks them. Why didn't he just shape shift out of them? And by the same token, if J'onn could break them, Lobo could too, so why would he call them unbreakable? But the worst offense of out of character action is for BOTH Superman and J'onn. During the wrapup, they're faced with what to do with the sole survivors of two planets that fell to Alpha. Ultimately, they leave the two survivors in Alpha's base, content in the knowledge that the hallucinogenic properties of the spores inside will help them forget. Superman and J'onn would NEVER do something like that! NEVER NEVER NEVER! (slaps Alan Grant) BAKA! It may be painful, but these survivors should face their tragedies if they can, or get psychiatric care. Leaving them to be stoned out of their minds for the rest of their lives is inexcusable. It may be their choice, but it's not a choice that a well written Superman would let them have. Burn that dang stuff up, and take them to where they can get help. YOU DON'T LEAVE THEM TO PSYCHO LA-LA LAND! Also insulting is how easily the "main villain" Alpha is defeated. There's utterly no drama to it at all. He conquers a planet, and within 30 pages, Superman and J'onn have the infastructure back up, and the b-plot with the other bounty hunters takes over. The only time the villain seemed menacing is when he has all the mains captured. He's actually got them wrapped up fairly well... So well, in fact that not only is it boring, but the way they escape makes no sense. If the Alpha is smart enough to design prisons that react to any use of their abilities, WHY THE BLUE HECK DOESN'T IT STOP J'ONN FROM USING TELEPATHY?!?! Alan Grant, you already disappointed us once with "The Stone King". Now you insult us with derivative drivel, filled with out of character moments. Shame on you! This is going on my do-not-reread shelf. And there is NEVER any excuse for a depiction of NAKED LOBO. NEVER. 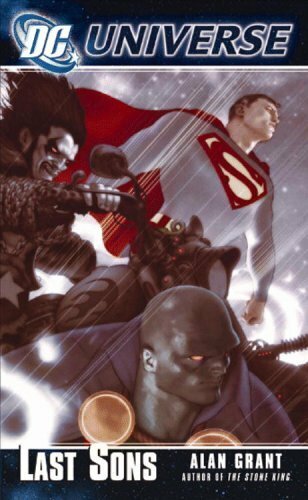 Cover Art - 4: Superman, Lobo, and J'onn racing through the stars. It happens, it's pretty, but for the life of me, what the heck is that white glowing thing next to J'onn on the bottom left corner?